Microsoft released the long awaited second cumulative update of the month KB4490481 for Windows 10 version 1809 yesterday evening. 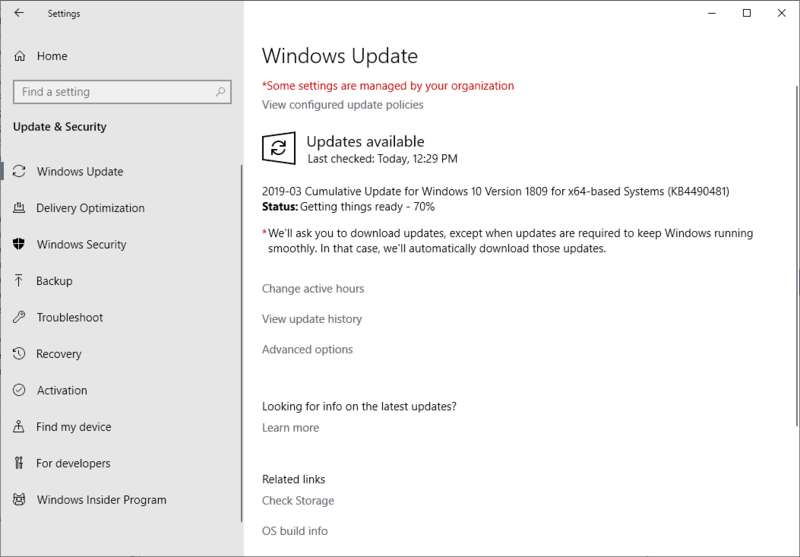 Why did it take so long to release when cumulative updates for all other supported versions of Windows 10 arrived on March 20, 2019? Because Microsoft learned from the mistakes it made when it released Windows 10 version 1809 and subsequent updates. It appears, that Microsoft pushes updates for the current version of Windows 10 to an extra round of testing, courtesy of the release channel, before it releases it to the general population. The update has been released, finally. Administrators may check for updates manually using Windows Update to download KB4490481 to machines. The update is also available as a standalone download on the Microsoft Update Catalog. Note: The update fixes a huge number of issues and still suffers from the same five known issues that previous versions of Windows 10 version 1809 suffered from. Fixed the long-standing audio issue that affected Windows 10 PCs with multiple audio devices. Fixed a Game Mode issue that impacted streaming and recording software. New option to activate Insider Builds of Windows 10 Enterprise for Virtual Desktops in Microsoft Azure. Fixed an issue that caused the loss of Favorites or Reading List in Microsoft Edge during updates. Fixed an issue that caused Internet Explorer to stop randomly. Addressed an issue with scrolling ActiveX content in Internet Explorer 11. Fixed an icon file loading issue if badly formatted icon files are encountered. Time Zone information updated for various locations. Fixed an issue with the GDI process that could cause the calling process to stop working under certain conditions. Fixed a networking issue that prevented applications and callers from connecting to destination endpoints when a network interface did not have a default gateway. Fixed a DHCP issue that caused it to reuse an expired lease. Fixed an issue with the RemoteApp window that would make it come to the foreground and to remain active after closing a window. Fixed an issue that prevented the authentication credentials dialog from appearing. Fixed an issue that prevented Modern Apps icons from appearing in the Taskbar or Task Switcher during RemoteApps connections. Fixed an issue that caused certain Modern Apps to fail to launch or stop working. Addressed an issue that caused USB cameras to fail to register correctly for Windows Hello. Added the Group Policy setting "Enable Windows to soft-disconnect a computer from a network". Fixed an issue that caused virtual smart cards from starting with Citrix 7.15.2000 Workstation VDA software. Fixed an issue that prevented users from configuring screens for HDR video playback. Fixed an issue that prevented users from unlocking a device using smart cards. Fixed a memory leak "when a system processes login sessions". Fixed an issue with Always-On-VPN exclusion routes that made them work only for link-local exclusions. Fixed an issue that muted the sound of single-use applications after resuming from Sleep. Addressed an issue to meet GB18030 certificate requirements. Set the Dword DeleteUserAppContainersOnLogoff to 1. Fixed an issue that prevented the decryption of data (affected encrypted data using DPAPI-NG or group-protected PFX file). Fixed an issue that affected the evaluation of the compatibility status of Windows. Addressed minor issues with unknown options (unknown OPT) in the Extension Mechanisms for DNS (EDNS) for the Windows DNS Server role. Fixed a timing issue when configuring Switch Embedded Teaming that could result in an access violation. Fixed an issue of the Remove-StoragePool PowerShell cmdlet that failed to clear pool metadata on NVDIMM physical disks. X2APIC supported enabled for AMD platforms. Fixed an issue that caused slow screen refreshes if applications created and destroyed many child windows. Fixed an issue that caused the Start menu to reset. Addressed an issue that caused Wdiwifi.SYS to stop working with the error "7E (0xc0000005)"
Custom URI Schemes for Application Protocol handlers may fail for local Intranet and trusted sites on Internet Explorer. There may be issues using the Preboot Execution Environment to start a device from a WDS server configured to use Variable Window Extension. Per font end-use-defined-characters may cause the system to stop working and may cause blue screens on start. Fixing a lot of bugs and things that don’t matter anymore because W10 1903 is coming. LOL. The real funny thing is I finally just got 1809 yesterday. 1903 will probably be pushed to users in July (or later). Millions of users will remain on 1809 for the next year or so. It still matters. As I recall on both my ASUS and ALIENWARE/DELL laptops, 1809 caused my WiFi network connection to “continually” disconnect with errors every so often – maybe as a result of a separate problem. I have seen no fix that seems to address this issue. I updated this morning probably an hour before You released this Blog. It downloaded and installed relatively quickly, and the restart was seamless. I know from our users and my own experience the last while it should be a very good improvement, although I have a fairly extensive FireWall Rules list, and Windows Update Mini Tool to properly control Windows Update. The Office 2016 Updates seem to be ok too. I did have issues about three weeks ago a few days after the last patch tuesday, but it was partly my fault as I had Controlled Folder Access setup on the root of Documents. Very bad idea… and then Windows Defender started messing up. 1809 has had so many issues. Hoepfully MS has done something right for a change. My task scheduler is still not showing the tasks status windows. Well it shows the windows, but it is empty. It really is one of mankind’s greatest hopes that Windows and the M$ corporate structure become so buggy and byzantine that they will declare it unfixable and simply go out of business. Windows remains because it is preloaded on most computers, it doesn’t matter how bad it is. It’s like a computer tax. System service exception here too on an Intel nuc with HD5000 graphics. Why doesn’t Microsoft use that AI that they keep advertising about to fix Windows 10? Windows 10 is one arm of an A/B Test. The other arm is MacOS. Usually people are excited about a new product launch, except for the next version of Windows 10. You would never see anybody camping outside of store to get the first copy of a Windows 10 release. Installed the update on two devices and both got hit by system service exception BSOD. Was only able to restore one of them with system restore, ouch. Are not the most perceived errors first valued? We must prioritize bugs (errors) according to their severity, not the number of reports they have. If there is a fault that overloads the computer and turns it off every time you try to access a file we have to solve it before one that prevents you from seeing a certain color on the screen. The insiders are doing a job that perfects a product for which Microsoft is making money. Do not you think that they should receive some remuneration or some kind of reward for what they do? We want to amplify their stories and give them a voice in our congresses so that they understand that they are heroes for us. It’s the people who help us make our products better. But we do not consider giving them compensation because they are not our employees or offering them any kind of reward because we believe that it is not the best idea. We have realized that those who do the best job are those who really love what they do, those who are experts and want to contribute. As with the Wikipedia contributors. What have you learned from the co-creation processes with the user? My work has taught me that users know their problem and what is the solution: what they do not know is how to implement it. Actually, they do not need to know how to do it. That is the task of the engineers. Many technology companies create a product and convince the user to use it, which is good for him, but, in reality, they do not need it. Companies that do not listen to their customers’ feedback, that do not continuously look at what their needs are, are outdated. They are trying to be their parents, when they have to behave like their peers. It is as if they told users to eat all the vegetables instead of sitting with them and defining a healthy diet with them. This is the best way to create a product: do it with the client. Donna Sarkar Presumed chief engineer of the insiders program and responsible for the sinking of windows 10! W10 Home should be free. Its a playground for micro$oft, that is abusing people as guinea pigs. Whats worse? That these poor users are also flooded with ads on login screen, cunty crash saga and so on…. This should be treatened as criminal act by micro$oft. I have installed this KB4490481 update on two computers – one PC running LTSC 2019 (HP pavilion m8417c w/ AMD phenom ii x4 b97 cpu with 6Gb of RAM) and another running Win10 Pro v1809 (a PC w/ an ASUS M5A78L mobo, AMD phenom ii x4 955 cpu w/ 8Gb of RAM). NONE of them had the BSODs with the KB4490481 update installed. For those who do experience blue screen errors with the KB4490481 update, please post some specs of your computers as the problem may specific to certain hardware ‘cuz I’m not getting the BSODs with KB4490481. 2 machines tried to update yesterday. First was able to be fixed by a rollback. Second is a basket case. Did F8 to get to safe mode repair. PC will not work with either wireless or wired input devices. Win10 Pro 64bits, winver 17736.379, updating with KB 4490481, blue screen on reboot, after 30% of the update being achieved (system exception, stop code) on 4 very different PC’s (materials, processors, graphic cards, RAM, …). Was able to only restore on a single one (Microsoft restoration point before windows update), the three others refused to enter the restoration environment, was obliged to restore via Acronis TrueImage monthly backups from my NAS. The only common point between these 4 computers : they all have a PCIe card SoundBlaster Audigy !!! could it be the explanation ?? Two of my PC’ crash with System Service Exception after installing KB4490481 on Windows 10 x64 1809. A dell laptop with intel graphics 520 and an intel nuc with intel HD5000 graphics. I’m suspecting an issue with the update and intel graphics drivers. Just a gut feeling. Windows 10 Home KB4490481 boots into blue screen Recovery. Clean install of Windows 10 from usb, then update to 17763.404 with no problems. Boots into blue screen Recovery. Restore to 17763.379 from system image backup. quite excellent !!! indeed, due to Windows Media Center, in my case v8.8.1, uninstall, reboot, install KB 4490481 and … bingo, it works, congrats !